Home » Interviews » BCP Interview – Christos Gage talks Buffy! 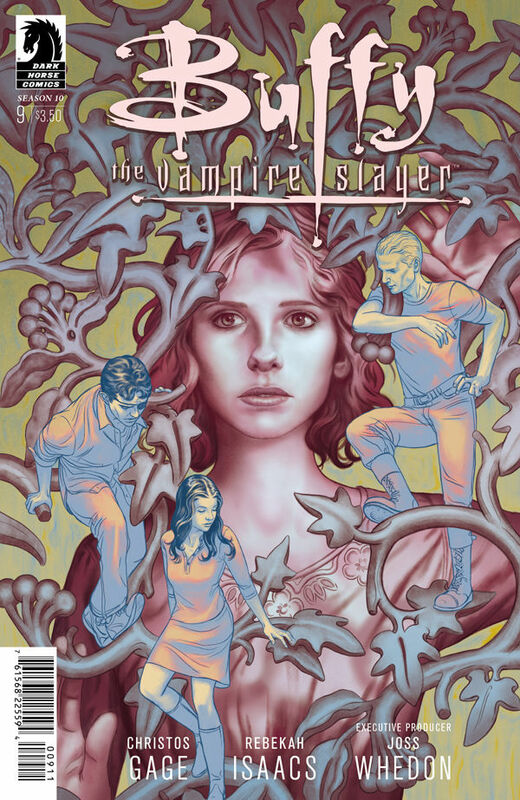 BCP Interview – Christos Gage talks Buffy! 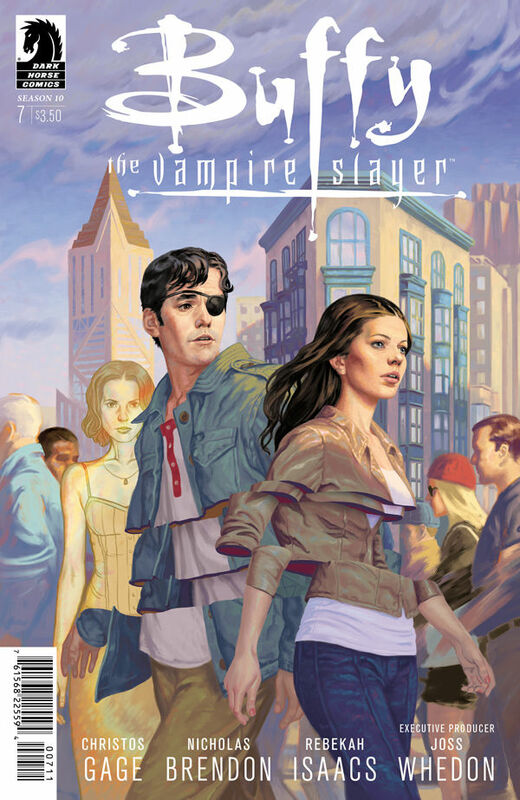 We’ve always been major Buffy fans here at the Big Comic Page, so when the opportunity arose for us to sit down and have a chat with Christos Gage, writer of Dark Horse Comics’ current ongoing “Season 10”, we absolutely jumped at the chance to pick his brains about his work on the critically acclaimed series. Big Comic Page: Firstly, thanks for agreeing to do this interview about your time with the Buffyverse! Okay, so I’ll start with the elephant in the room; how did you get the gig in the first place, and how much input to the direction of the book is yours and how much is down to Joss? Christos Gage: Initially I got the job writing ANGEL & FAITH when Scott Allie approached me in the bathroom at the first C2E2 convention and said he’d read my Vertigo graphic novel with Chris Samnee, AREA 10, and really dug it. He asked if I might be interested in writing an Angel comic. And I’d never seen an Angel or Buffy show. So I watched a few and loved them, and took the job and then binge-watched twelve seasons of awesome TV. I guess people liked what Rebekah and I did with Angel & Faith because we were then offered Buffy for Season 10. As for the direction of the book, before each “season”, we have a day-long writer’s summit, which includes the writers of the comics, the editors, Joss himself, and usually some other Buffy-related folks, like Jane Espenson, Drew Greenberg, and for Season 10, Nicholas Brendon. That’s where we work out the “spine” of the season’s story…sort of the broad-strokes outline. It’s very much like a TV writer’s room, with Joss as the showrunner. Following that, I’ll do a more detailed season outline, and then a still more detailed one for each arc (like, a paragraph or two for each issue) before I start writing it. All the outlines and scripts are sent to Joss, but of course he’s a busy guy and isn’t necessarily able to weigh in on everything, which is why it’s important to have the summits and get the big stuff worked our ahead of time. He does weigh in on things, though, like when we wanted to have Andrew finally figure out that he’s gay. Jane and Drew were incredibly helpful with that arc as well. BCP: More recently, you’ve been working with Nicholas Brendon on the book. How has it been working with someone who essentially was a character in the universe for a long time? Has it helped with creating a stronger voice for the character? CG: Oh, it’s been a lot of fun. Nicky and I meet up at a café and talk over the story. As he often says, while several of the characters’ personalities are quite different than the actors portraying them, Nicky pretty much is Xander, except that Xander is into nerdy stuff while Nicky is into baseball. (I can handle the nerdy stuff part quite well myself.) So it is like being able to talk to Xander. Also, Nicky’s training and experience as an actor makes a big difference. I always say there’s no point in having a writing team if you just duplicate each other’s skills; that’s redundant. You want to complement each other. And Nicky approaches dialogue from an actor’s perspective. He’ll often say a line to himself a few times before coming up with just the right response for it. He also comes up with great set pieces, like the giant vampire getting staked on the pointy building in the first arc, and the idea for the upcoming issue where Giles gets re-aged to adulthood for a day. So it’s been a very positive experience. BCP: The previous arc, and to a lesser degree the one starting with the latest issue (#14), has dealt a lot more with love, relationships and sexuality in a way that has shifted the tone of the book drastically from the horror/fantasy aspect of the rest of the season to a much deeper and emotional subject. Was this a conscious decision? CG: To me, the Buffyverse has always worked best when it mirrors universal life experiences we (or people we know) go through, but with a supernatural bent. That’s what I’ve tried to do. For this season, it’s the stage where we enter adulthood. When we have to make our own decisions, with no one helping us, and live with the consequences. A big part of that is figuring out what we want out of relationships and love…maybe looking at what’s worked and what hasn’t, and hopefully figuring some things out. So I don’t really see the examination of those matters as a departure; to me the relationship stuff and the horror/fantasy go together naturally in this world. There’ll be other things too, of course, but we’re immersed in the relationship stuff at the moment. BCP: These themes were always strong on the TV show, and have provided a great influence in helping lots of young people find themselves. Do you hope that your take on the story can be used similarly? Also, what have you drawn from as inspiration for this storyline? CG: It would, of course, mean a lot if people found any kind of inspiration or support in the stories. Jimmy Leary (who played Clem) and I were just tweeting each other about a lovely letter sent in by a young lady who is inspired by Clem and thanked us for keeping him around, which was very gratifying. But ultimately, we’re not making after school specials here (if anyone’s old enough to remember those), we’re trying to entertain. If in the course of doing so people find something that is meaningful to them, that’s wonderful, and humbling. We know what these characters mean to people, and take that seriously, but hopefully never to the point where we get preachy or heavy handed. As for inspiration, like I said, the Buffyverse works best when it touches on universal experiences. I’m…let’s say a smidgen older than the characters, but I still don’t feel like I’m equipped to make intelligent, responsible, grownup decisions. I’ve made a lot of mistakes, and hopefully one or two good decisions as well, and I draw from all of them. Of course, some things are out of my wheelhouse, like Andrew realizing he’s gay. (I’m pretty much your boring straight white guy.) Luckily, I had help from Drew Greenberg, who was kind enough to share some of his own experiences in figuring that out, and Jane Espenson, who is very familiar with the character. BCP: Speaking of seasons, it seems to be a regularly new thing for comics to have them. Buffy being one example, Saga being another. Both books consistently ship on time and never seem to have “filler” issues – something that can be a fairly significant problem on certain other titles. What’s your take on the idea? CG: I don’t think there’s a “one size fits all” approach. Every book is different. I know on Saga, it’s very important to Brian Vaughan that only Fiona Staples draw the book, so they have built in “season breaks” to allow her to keep up what I’m sure is a grueling pace as she handles all aspects of the art. On Buffy, the property has been around a long time and isn’t associated with any particular creator outside of Joss, so it seems a bit more important that it come out regularly. But we also have an artist in Rebekah who both pencils and inks (with awesome color from Dan Jackson and lettering from Jimmy Betancourt), for whom a monthly pace would be unrealistic. So we determine that certain issues will be done by other artists. When possible, we like to bring in people who are already associated with the Whedonverse, like Karl Moline (artist of Joss’s FRAY) or Phil Noto, but sometimes, as with Megan Levens, someone new comes in who is a terrific fit, to the point where she’ll be doing all the guest spots for the rest of the season. At the end of the day, I think this sort of thing can be handled many different ways, and is only problematic when it isn’t planned for, and ends up being a surprise that forces creators and publishers to scramble, and confuses readers, who aren’t finding a book in the store when they expect it. Ideally, you can get an idea of what you’ll need early enough to plan out a schedule that works for everyone. BCP: With the current controversy surrounding Joss having ‘weak female characters’ and presenting them as damsels, Buffy has always stayed incredibly strong as an undeniably positive female role model. Why do you think that is? CG: I think that “controversy” is a bit silly, to be honest. I haven’t seen Age of Ultron, but I have yet to see anything Joss did fit that description. He’s written female characters that are heroic, selfish, brave, flawed, psychotic and brilliant. He writes female characters as human beings, with all the varied characteristics human beings have – from Buffy to Faith to Harmony. I think Buffy has remained a positive role model because we can all – male, female and anywhere in between – see qualities of our own in her. She’s not perfect, she makes mistakes, but at the end of the day she does her best and tries to do the right thing, no matter how hard it is. Which is not an easy thing. So I think she embodies the best qualities of a hero: she reminds us of ourselves while also reminding us how we’d like to be, and hopefully inspiring us to try to be that. Steve Morris’ cover to issue #9 – Click for the full-size cover. BCP: In the most recent issue, we meet what seems to be the very, very first vampire? The “old ones” have been popping up in Buffy for a while now. What background reading did you have to do to bring this new character to life, if any? CG: I feel like I screwed up there, because Archaeus is not the first vampire. The first true vampire was sired by the Old One, Maloker, who we recently saw in the first BTVS Season 10 story arc. And over time vampires have evolved, from the Turok-Han to what we see today. I did a bad job of making clear that Archaeus is not a vampire, nor is he an Old One. He is a demon lord, like many others we’ve seen over Buffy’s seasons. What makes this one interesting is that part of Archaeus’ essence is in Angel and Spike. See, the way vampires work in the Whedonverse is this: when a vampire sires a human, they die – their soul leaves their body – and is replaced by part of the essence of a demon from a Hell dimension. This creates a brand new being, a vampire, that is a combination of the original human’s personality (usually their darkest qualities) and the essence of the demon. My theory is that the vampire’s relationship with the demon whose essence is in them can vary widely, depending on how powerful that demon is. Usually, the demon in question doesn’t have much, if any, influence on the vampire. But if the demon is powerful enough, they might…though usually only if they are in the same physical dimension as that vampire. Also, if the demon is strong enough, they can increase their potential power by sowing their essence from one vampire into others sired by that vampire…theoretically, building an army they can command if they ever come to Earth. That’s what Archaeus has done. I really made this a lot more confusing than it had to be, sorry! I will try to clarify going forward. BCP: On the subject of reading, what’s in your read pile these days? CG: A lot of stuff…off the top of my head, Silver Surfer, Saga, Mind MGMT, Astro City, BPRD, Imperium, Rat God, Thor, Ragnarok, the Creepy, Eerie and Vampirella Archives…there’s a lot more. I also recently read Mike Carey’s novel, The Girl With All The Gifts, and really enjoyed it. BCP: I’ve been really enjoying your run on the series and can’t see anyone else stepping into the massive shoes you’d leave. Do you see yourself staying on Buffy in the long term? CG: I’m just focused on trying to get the next script in! Pretty soon we’ll have to think about the future, but I’m not going to until I absolutely have to. Thanks, though! BCP: What can you tell us, if anything, about what to expect the rest of the season? CG: There’ll be a crossover with Angel as he guest stars for a few issues, the timing of which is delightfully awkward. Then Giles will become an adult again, though just for a day. We’ll see some of our characters working with the San Francisco Police, and we’ll see the world at large dealing with increasing demonic activity. And yet ANOTHER old love interest of Buffy’s will be back. I think that’s about all I can say without getting too spoilery. BCP: How do you find working with Marvel and DC differs from working with Dark Horse on an already established series? CG: It’s less a publisher difference than a matter of what characters you’re working on. Writing Buffy with guidance from Joss is a bit like I’d imagine it was for Roy Thomas, say, writing Avengers when Stan Lee was still Editor In Chief. You’re running with it, but you have the co-creator available to consult with. Whereas working on Spider-Man now…Stan is still around, happily, but it’s been a long time since he was involved in the day-to-day. Spidey has become a shared mythology, with contributions from a host of talented folks, from Stan and Steve Ditko to John Romita to Gerry Conway to Todd McFarlane to Roger Stern to Dan Slott. With Buffy you still have the guy who started it all directly involved, which is a big help, but also intimidating…I don’t want to mess it up! BCP: Rebekah Isaacs has been absolutely killing it on the book with her style and design. How much artistic direction do you give her, or is it just a case of letting her go with monster design? CG: I completely agree, she is unbelievably good. The more I work with Rebekah, the less direction I give her, because what she does is almost always better than what I come up with, especially when it comes to monster designs. I quickly discovered how good she was at that, so now I just throw some random words in the script – tentacles, exposed skull, fire breathing, GO! – and let her talent run wild. She’s also amazing at character “acting”. I don’t fear talky scenes because she makes them work so well. You always know how the characters feel, so the scenes don’t seem static, they’re powerful and emotional. It’s the closest you can get to having actual actors, which is really important for a book based on a TV show or movie, I think. BCP: Are there any other artists you would like to work on the book with? CG; Barry Windsor Smith, can you make that happen? ;) Look, I’d be thrilled to work with Rebekah forever, but every artist we’ve had on the book has been great. Megan Levens is our regular relief pitcher this season, and she’s terrific. She has similar strengths to Rebekah, but in her own distinctive style. Dark Horse has also gifted me with the likes of Phil Noto and Chris Samnee in my time on the Buffy books. And Scott Allie finally gave into my whining and got Richard Corben to do three pages in BTVS #8! That was a dream come true. So I have no complaints and trust Dark Horse fully in terms of whoever they recommend. BCP: Do you have any other books in the works that you can talk about? CG: My wife/writing partner Ruth and I collaborated on an original graphic novel coming out from Oni Press this summer. It’s called THE LION OF RORA, and we’re very proud of it. It’s a historical epic along the lines of Braveheart, about a little known group of people called the Waldensians who did some amazing things in fighting for freedom from persecution. Ruth is Waldensian herself, and has researched this for many years, so it means a lot to us to see it finally come out. The artist, Jackie Lewis, is amazing! We’re very excited for people to see it. I’m also currently writing a Spider Island miniseries for Marvel that is part of Secret Wars. That’s all I can talk about at the moment! BCP: Thanks again for agreeing to talk to us! 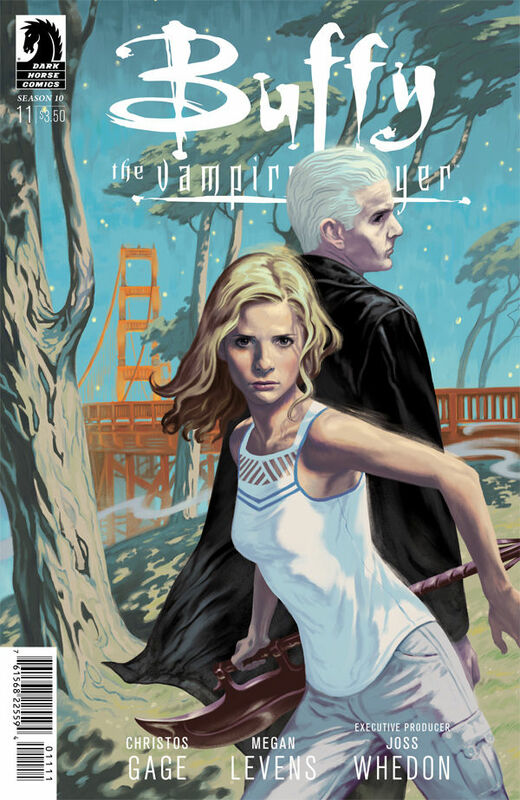 Buffy The Vampire Slayer Season 10 #15 goes on sale May 20th from Dark Horse Comics.